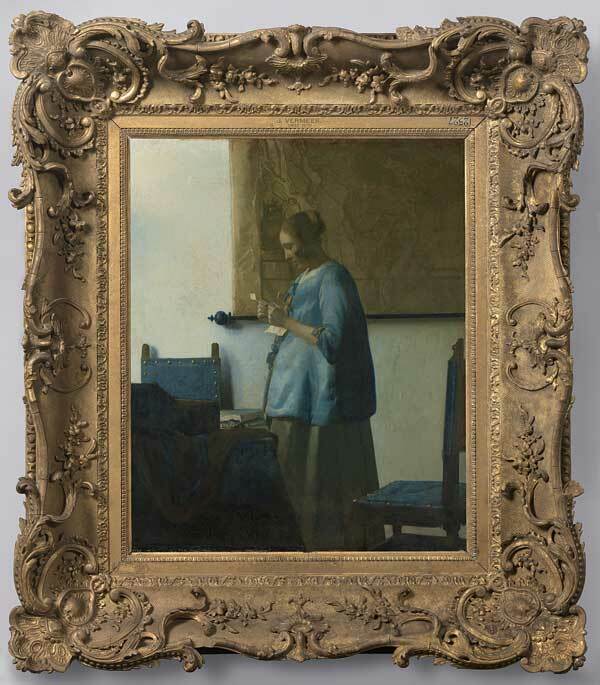 Johannes Vermeer’s Woman in Blue Reading a Letter has been thoroughly cleaned and restored, revealing new details about the original masterpiece and removing later interpolations. Woman in Blue was the first Vermeer the Rijksmuseum ever acquired. It was purchased from a London art dealer by Amsterdam banker Adriaan van der Hoop in 1839. He bequeathed it to the city of Amsterdam which put it on display at the city’s Academy of Fine Arts from 1854 to 1885, then loaned it to the Rijksmuseum where it has remained ever since. Over the years, age, yellowed varnish, retouchings and other questionable conservation choices dimmed the glory of its sublime blues, but major projects to correct those issues are so expensive they’re usually reserved for works that have major condition problems that endanger the immediate health of the painting. Museums rarely have the funds to overhaul a painting just to make it look great again. In 2010, the Rijksmuseum got its chance when Japan requested they allow Woman in Blue to tour the country, which would be the painting’s first trip to Asia. Japan offered to fund a full restoration of the painting before it left Amsterdam in return for the loan, and the Rijksmuseum accepted. Conservator Ige Verslype, supervised by an international committee of experts, spent more than a year painstakingly restoring the piece, focusing on returning the picture as much as possible to its original condition. Before doing anything, he examined the work with the latest imaging technology (infrared reflectography and X-ray fluorescence scanning) and took five tiny paint samples from key places. 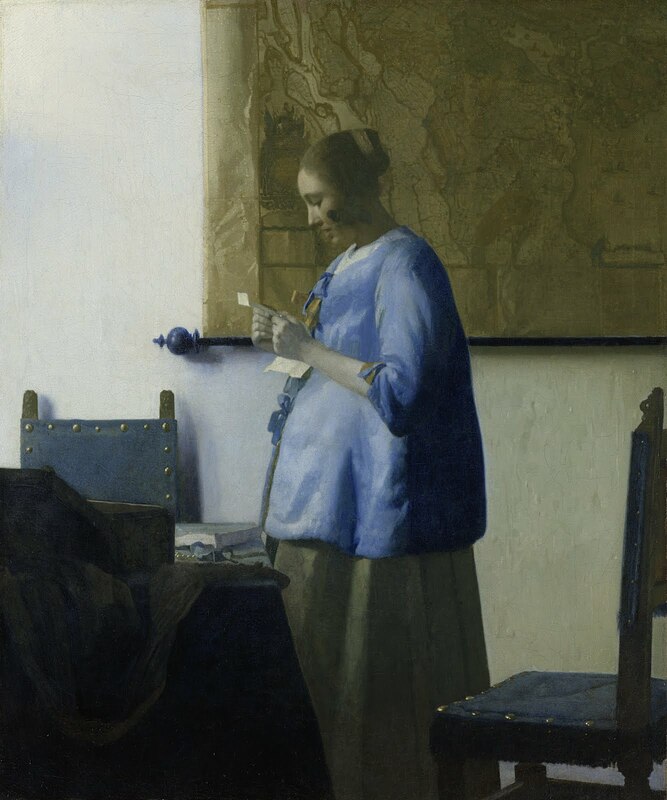 He then removed most of the yellowed, cracked varnish, thus bringing the original color of the woman’s jacket back to vibrancy and unveiling the secret of Vermeer’s blue paint. Before the restoration, the dark blue on the back of her jacket that’s in shadow looked the same color as the blue velvet on the top of the chair. After the restoration, you can clearly see that they are different shades. Next to go were the retouchings and overpaintings from previous restorations. In 1928, restorers mistook three white spots on the box or paper on the table in front of her as pearls. Vermeer used pearls in many of his paintings, and there were other pearls on the table in this painting. The restorers daubed some yellow on those white spots to make them noticeably pearls. This time around, conservators had scans to show that in fact those spots weren’t pearls, but simply white highlights. Verslype removed the yellow, returning the superfluous pearls to highlights. Removing overpaint and varnish from the chairs showed them in a whole new light. You can see details of the upholstery that before were shrouded in darkness, like the edges of the velvet backing wrapped around the side. They also discovered a whole new row of brass nails on the side of the chair seat that had been completely covered in dark paint. Once the restoration was complete, the Woman in Blue went on her first Asian tour, starting in June 2011 in Kyoto, then moving to the Miyagi Museum of Art in Sendai, and finally Tokyo’s Bunkamura Museum of Art. The tour ended on March 14, 2012, and the painting returned to the Rijksmuseum. There it was put back on display on March 30, the first time Dutch audiences had a chance to see the restored work, and the first time in two years they got to see the painting at all. 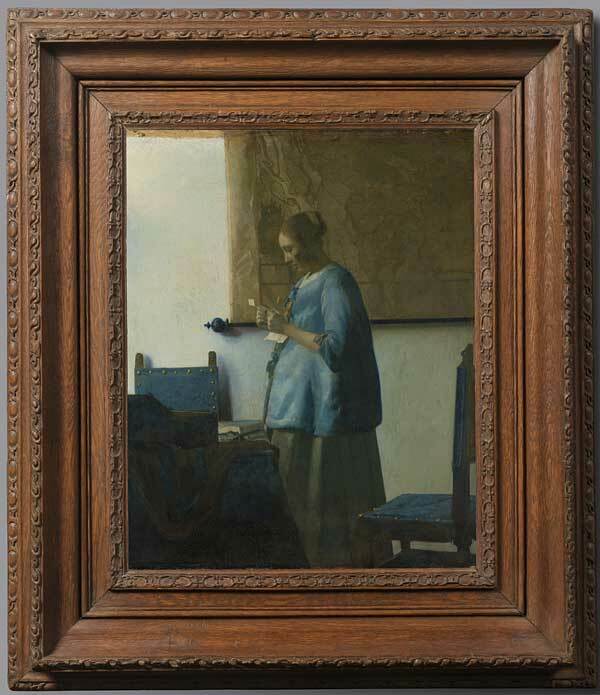 Along with the freshly blue Woman in Blue, four frames that have encased the painting over the years at the Rijksmuseum are also on display. The first one is a neo-rococo frame that was on the painting from when Adrian van der Hoop bought it all the way through the 1940s. Then it was reframed using a carved oak frame from around 1700. 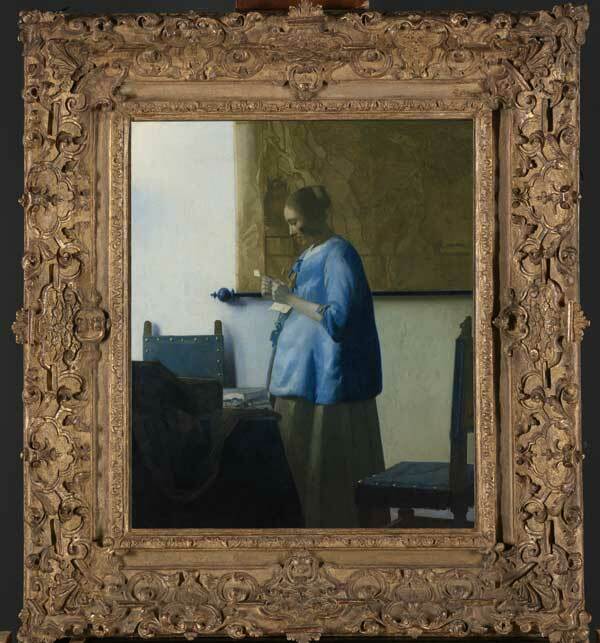 In the early 1960s, Woman in Blue was reframed again, this time in a gilded French Regency frame from ca. 1710. The last of the four was a modern ebony reproduction frame used starting in the 1990s. None of them are quite right for the masterpiece. 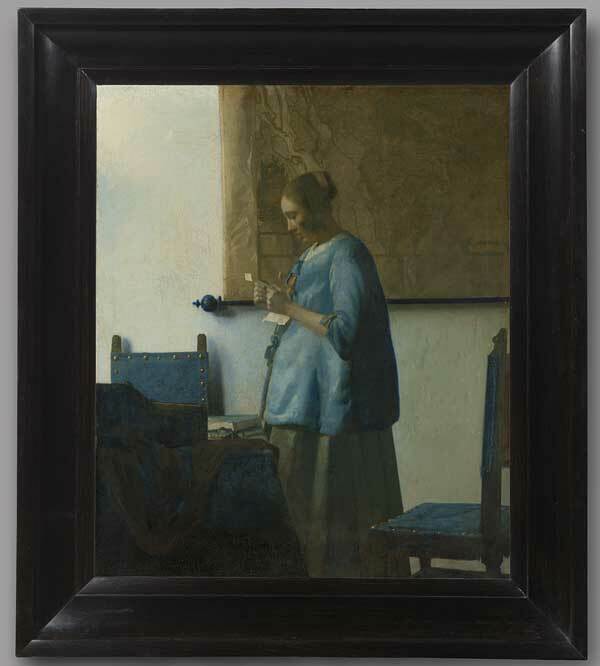 Conservators have taken the opportunity to study carefully what Vermeer preferred to use for frames. Ebony seems to be the consensus material, but the contemporary ebony-like frame, smooth and machine-tooled, flattens the look of the painting. The Rijksmuseum is looking for a simple ebony frame from the 17th century but hasn’t been successful yet. While the search is on, they’re using the gilded Regency frame.